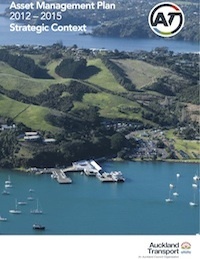 The Auckland Transport – Asset Management Plan is available here. This document provides a framework for Auckland’s Transportation plans in the context of existing Auckland documents and plans. The document also identifies strategic issues and implications for asset management. The process for developing an Asset Management Plan is also described. This document includes the following sections: Communications and Reporting, Current Methods and Tools, Introduction, Levels of Service, Process Improvements.